For Americans, cell phones are omnipresent. Many check their Facebook page multiple times a day. Access to WiFi is not a problem for most. Technology use in the U.S. has risen over the past two decades as products and service became more sophisticated and affordable. A new Pew Research Center report provides a fascinating snapshot of how, within a remarkably short time, some developing nations are catching up – especially when it comes to mobile devices and social media. In other cases, the data are a reminder that some countries still have a technology profile that is 20th Century. Here are some of the key comparisons. Recent surveys at Pew Research show that 91% of American adults have cell phones and that smartphones have overtaken simpler “feature phones” in popularity. The adoption pattern of cell phones in emerging countries like Turkey, Lebanon and Chile do not look very different from America. China and Russia have even nudged ahead of the U.S. But other countries lag. 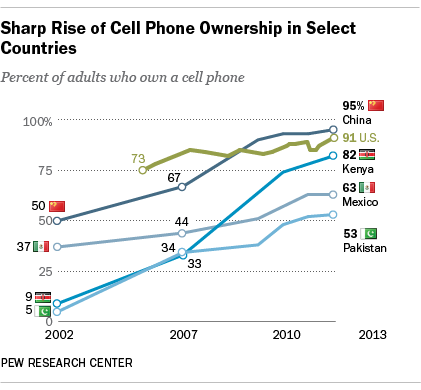 In Pakistan, slightly more than half have a cell phone and in Mexico, it’s just above six-in-ten. Still, the rapid rise in cell phone ownership is quite breathtaking and might be due to the fact that many nations, unlike the U.S., have skipped landline technology and moved straight to mobile. Smartphone adoption, however, shows a different picture. More than half of Americans (55%) have a smartphone, 34% have a feature phone, and 9% have no phone. 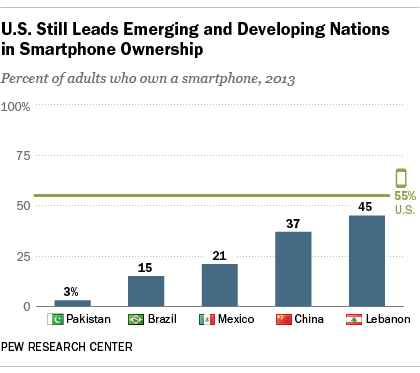 Elsewhere in the world, a smartphone is less common. However, significant minorities in countries such as Lebanon (45%) and China (37%) own a smartphone and the future looks bright for the technology. In every country polled, there is a significant age gap on smartphone ownership, with people under 30 more likely to own the devices. For instance, 69% of 18- 29 year-olds in China have a smartphone, making it the predominant technological choice for future generations. 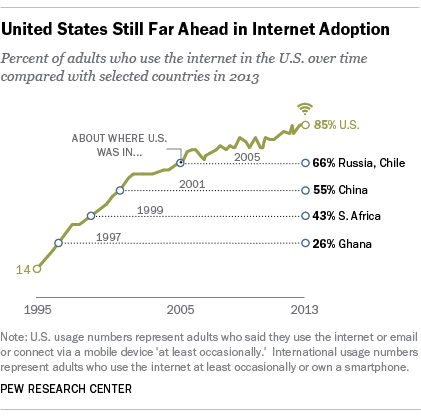 In 24 emerging and developing nations surveyed, internet adoption varies widely. In countries such as Russia, Argentina, Chile, and Venezuela, more than half the adult population says they use the internet. But that number is far lower in Pakistan, where only 8 percent of adults do, and Ghana, where only 26% are online. In the U.S., 84% use the internet. Some 71% of Americans use the internet at least daily; another 13% use it weekly or less often. The U.S. data show considerably higher adoption and usage rates of the internet than the figures coming from emerging nations. Roughly speaking, higher-adoption locales like Russia and Argentina show tech adoption similar to the U.S. in 2005, middle-adoption locales like China show adoption similar to rates in the U.S. in 2000-2001, and lower-adoption places like Ghana show adoption similar to rates in the US in the mid- to late-1990s. 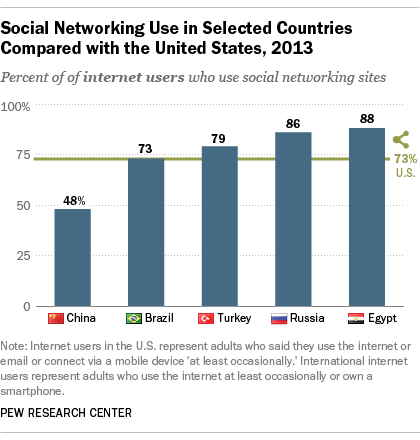 Internet users in emerging countries are relatively advanced in their use of social media, compared with the U.S. Even though a smaller share of adults are online in other countries, those who use the internet are avid social media users. Our latest U.S. survey shows that 73% of internet users are social networking site users. By comparison, in 20 of 24 nations surveyed, seven-in-ten or more internet users participate in sites like Facebook and Twitter, including slightly less than nine-in-ten internet users in Egypt (88%), Russia (86%), and the Philippines (86%). Only in China do less than a majority of internet users access a social networking site. That means that many of the countries in our global survey show a higher share of internet users as social media aficionados. However, it is important to note that internet access is much less common in all of these emerging and developing countries compared to the U.S., so as a total proportion of the population social networking usage is still practiced only among a minority in most of the countries surveyed. But those who go online in poorer countries are early adopters and they are enthusiastic to try the newest digital technology applications. Thus, these countries have a relatively modest share of their entire population online, but those who are online are eager for social media to a greater degree than Americans are. In addition, many U.S. internet users went online before social networking sites took off in American in 2008-10. For some, that made them very comfortable with earlier “social” tools like email and not necessarily as interested in some of the more recent social media platforms. Information graphics designer Jessica Schillinger created the global comparison charts.